It's the last round for our team Q and A. Kelli answered the 5 questions that we asked everyone on the team to get to know one another a little better. The Grand Opening is tomorrow from 6-8PM - please stop in and see what we've been busy doing! Celebrity Sighting: Strangely, I’ve met or been in the same room with many, but the best story was Dave Mathews back in the heyday. I was with my sister and friend who knew someone so we could go backstage to a special area. We chatted for a few minutes and as he was leaving, I got a hug and a kiss... well, we all did but it was a highlight - I think my sister still has that photo hanging up somewhere! Pen vs Pencil: Pencil, any type works but I do love a mechanical one which goes back to my graphic design days, reaching into the container, I’ll always grab a pencil before a pen. Guilty Pleasure: Every month when my Town & Country magazine arrives, the first thing I do is open it up to the Stars & Signs section and read my horoscope. It’s now become a thing I look forward to every month - strange but true. Perfect Meal: Ceviche in Puerto Morelos, Mexico. Fresh mixed seafood with cilantro - I could eat it all day long with chips! 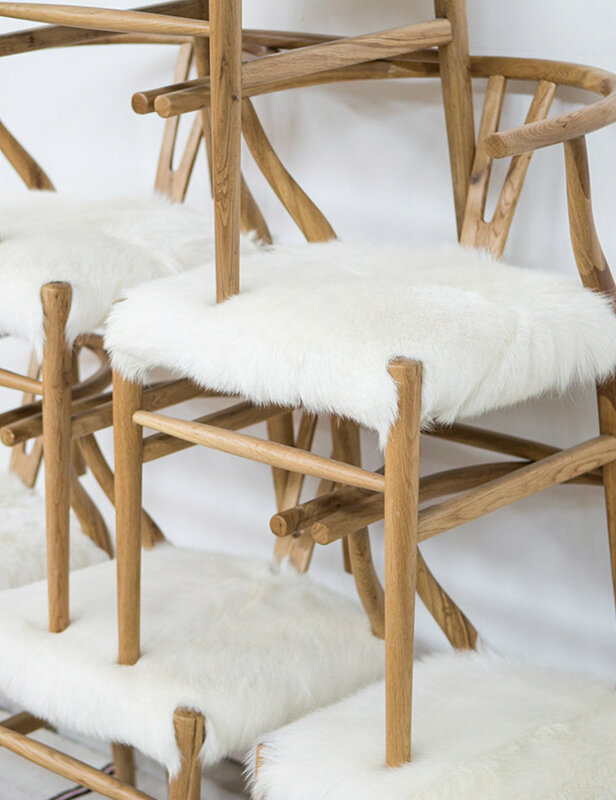 Where mid-century design and classic iconic style come together, the acacia wishbone chair has natural and minimalist fluid lines that create an airy feel. 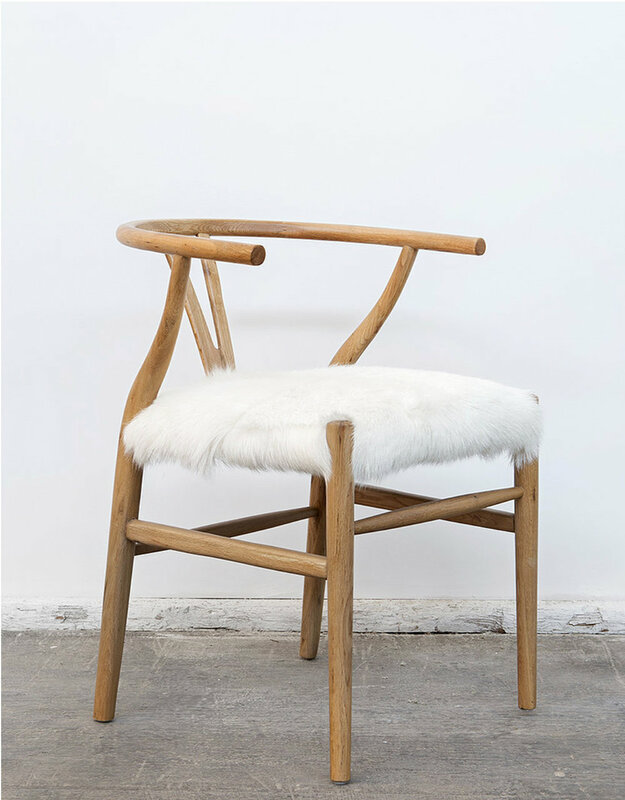 The white Mongolian goat hide seat brings this iconic wishbone chair into the modern day. Use as a statement piece on its own or outfit your entire dining table with these funky quintessential chairs. It's round two of our team Q and A with the 5 questions that we asked everyone on the team to get to know a few new things about each other. Here's Esther's answers! If you missed Nicole's answers (and her dinner with BJ Novak), check out our blog post from 7/17. Celebrity Sighting: my family played pickup basketball with Doug Flutie while on vacation. Pen vs. Pencil: Sharpie pen - not the marker but it’s the black one with a fine tip - I write all my important lists with it. Perfect Meal: right now, salmon prepared any way....when I was younger, I was convinced I didn’t like fish so my dad grilled it up a few years back and I was hooked! Of course, I can’t leave out dessert - I love cheesecake. Celebrity Sighting: B.J. Novak bought me dinner once - ask me someday I’ll divulge the details.. Pen vs. Pencil: Well, more like marker - the Papermate Flare Medium Tip in fuchsia is my go to – it makes me happy. Guilty Pleasure: My Sunday morning ritual is reading PostSecret Blog - it’s anonymous secrets mailed in on home-made postcards… look it up - you can’t stop reading! Mountain vs Beach: Beach all the way. I’m not a huge fan of the water but I love the sun and sand – my favorite place is Corolla Beach in the Outer Banks. Perfect Meal: Prosciutto, crusty bread (preferable Tuscan garlic from Wegmans) and any kind of stinky cheese - add a glass of white wine and all good. 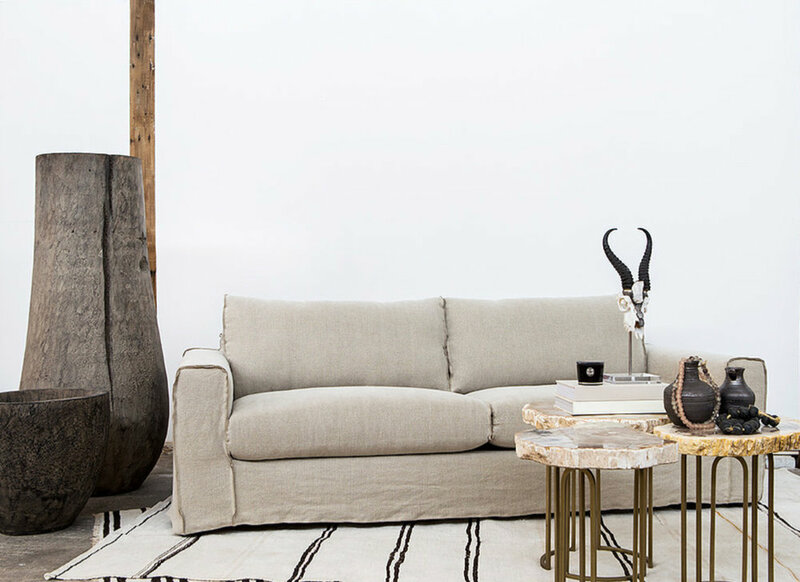 This linen slip-covered sofa can play to different moods based on how you accessorize. We love this couch paired with a few colorful pillows that can be swapped out when the seasons change – the definition of relaxed luxury. The heavy cotton linen is casual and comfortable yet still adds sophisticated and livable style to any room. We have a slipcovered armchair available as well. Handcrafted from authentic West African mud cloth, our pillows reflect the centuries-old art of mud dyeing cotton and embellishing it with distinctive tribal patterns. In a time-intensive process, local artisans bathe the cotton in natural dyes made from tree leaves and dry it in the sun, then hand paint traditional geometric motifs using fermented river mud. Rich in meaning, the geometric markings often tell a story about the maker or local history. Woven and dyed by hand, each pillow cover is uniquely one of a kind. 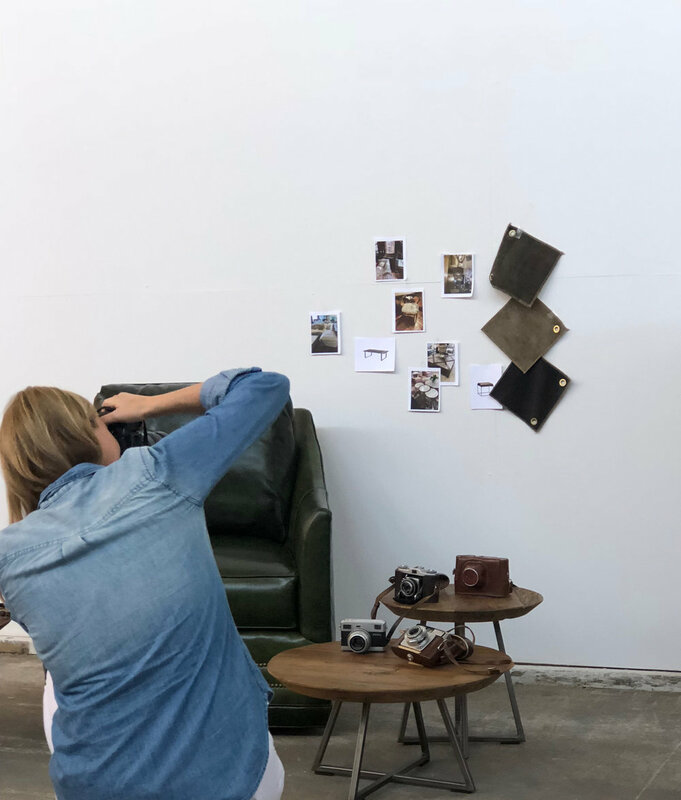 Each Aquiesse candle is hand-crafted in California where the art of creativity is backed by extensive research and craftsmanship to ensure that only the finest ingredients are used in the cleanest, best burning soy candles. Aquiesse candles are distinguished by a mastery of exquisite fragrances inspired by nature. The suite of scents is sophisticated yet approachable, intriguing yet soothing and offers something to inspire everyone. The timeless style of this market tote is perfect for the modern world, made of hand-woven palm fronds and tan leather. Beautiful and practical, these bags are crafted with time-honored techniques. Take it with you to the farmers market, the beach or use them around the home for stylish storage. The backpack style is perfect for cyclists, picnics and shoppers out and about. Bonus - these baskets are sourced from women’s collectives in Bangladesh and Morocco. With the Grand Opening in just a few short weeks, we have been busy unpacking and photographing lots of pretty inventory! Here are a few shots from last week. More to come so check back often!